As February is thought of as a month of love, it is terribly fitting, IMHO, to remember this great lover and poet, and most importantly, as always, The Object of his love. 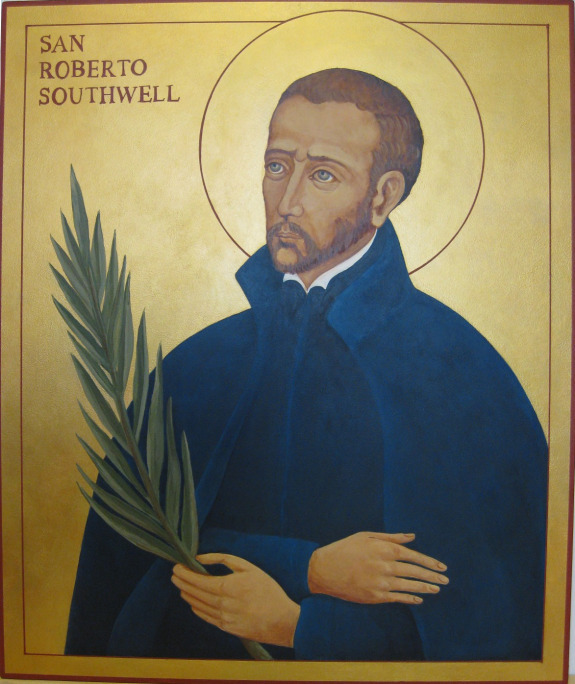 Robert Southwell was born at Horsham St. Faith’s, Norfolk, England, in 1561, the third of eight children. His grandfather, Sir Richard Southwell, had been a wealthy man and a prominent courtier in the reign of Henry VIII, and the family remained among the elite of the land. He was so beautiful as a young boy that a gypsy stole him. He was soon recovered by his family and became a short, handsome man, with gray eyes and red hair. It was Richard Southwell who in 1547 had brought the poet Henry Howard, Earl of Surrey, to the block, and Surrey had vainly begged to be allowed to “fight him in his shirt”. Curiously enough their respective grandsons, Robert Southwell and Philip, Earl of Arundel, were to be the most devoted of friends and fellow-prisoners for the Faith. On his mother’s side the Jesuit was descended from the Copley and Shelley families, whence a remote connection may be established between him and the poet Percy Bysshe Shelley. Despite their Catholic sympathies, the Southwells had profited considerably from King Henry VIII’s Suppression of the Monasteries. Even as a child, Southwell was distinguished by his attraction to the old religion. Protestantism had come to England, and it was actually a crime for any Englishman who had been ordained as a Catholic priest to remain in England more than forty days at a time. In order to keep the faith alive, William Allen had opened a school at Douai, where he made a Catholic translation of the Bible, the well-known Douai version. Southwell attended this school and asked to be admitted into the Jesuits. At first the Jesuits refused his application, but eventually his earnest appeals moved them to accept him. He wrote to the Jesuits “How can I but waste in anguish and agony that I find myself disjoined from that company, severed from that Society, disunited from that body, wherein lyeth all my life, my love, my whole heart and affection.” (Archivum Romanum Societatis Iesu, Anglia 14, fol. 80, under date 1578). He was ordained a priest in 1584. Two years later, at his own request, he was sent as a missionary to England, well knowing the dangers he faced. A poet and a scholar, his poetry would have a profound influence on the moral climate of the age. A spy reported to Sir Francis Walsingham the Jesuits’ landing on the east coast in July, but they arrived without molestation at the house at Hackney of William Vaux, 3rd Baron Vaux of Harrowden. For six years they kept him under surveillance. He assumed the last alias “Cotton” and found employment as a chaplain to Ann Howard, Lady Arundel, her husband being accused of treason for being a Catholic and in prison. Southwell wrote a prose elegy, Triumphs over Death, to the earl to console him for a sister’s premature death. Although Southwell lived mostly in London, he traveled in disguise and preached secretly throughout England, moving from one Catholic family to another. His downfall and capture came about when he became friendly with a Catholic family named Bellamy. 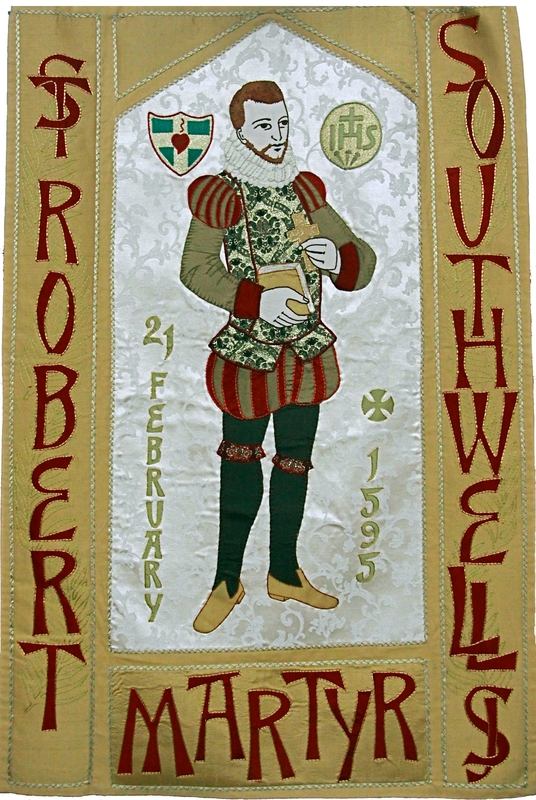 Southwell was in the habit of visiting the house of Richard Bellamy, who lived near Harrow and was under suspicion on account of his connection with Jerome Bellamy, who had been executed for sharing in Anthony Babington’s plot, which intended to assassinate the Queen and place Mary, Queen of Scots, on the English throne. One of the daughters, Anne Bellamy, was arrested and imprisoned in the gatehouse of Holborn for being linked to the situation. Having been interrogated and raped by Richard Topcliffe, the Queen’s chief priest-hunter and torturer, she revealed Southwell’s movements and Southwell was immediately arrested. When Bellamy became pregnant by Topcliffe in 1592, she was forced to marry his servant to cover up the scandal. Southwell was first taken to Topcliffe’s own house, adjoining the Gatehouse Prison, where Topcliffe subjected him to the torture of “the manacles”. He remained silent in Topcliffe’s custody for forty hours. The queen then ordered Southwell moved to the Gatehouse, where a team of Privy Council torturers went to work on him. When they proved equally unsuccessful, he was left “hurt, starving, covered with maggots and lice, to lie in his own filth.” After about a month he was moved by order of the Council to solitary confinement in the Tower of London. According to the early narratives, his father had petitioned the queen that his son, if guilty under the law, should so suffer, but if not should be treated as a gentleman, and that as his father he should be allowed to provide him with the necessities of life. No documentary evidence of such a petition survives, but something of the kind must have happened, since his friends were able to provide him with food and clothing, and to send him the works of St. Bernard and a Bible. His superior St Henry Garnet, SJ, later smuggled a breviary to him. He remained in the Tower for three years, under Topcliffe’s supervision. Tortured thirteen times, he nonetheless refused to reveal the names of fellow Catholics. During his incarceration, he was allowed to write. His works had already circulated widely and seen print, although their authorship was well known and one might have expected the government to suppress them. Now he added to them poems intended to sustain himself and comfort his fellow prisoners. He wrote “Not where I breathe, but where I love, I live; Not where I love, but where I am, I die.” He was so ill treated, his father petitioned the Queen that he be brought to trial. February 21, 1595, Southwell was brought to Tyburn, where he was to be hung and then quartered for treason, although no treasonous word or act had been shown against him. It was enough that he held a variation of the Christian faith that frightened many Englishmen because of rumors of Catholic plots. He addressed the crowd gathered, “I am come hither to play out the last act of this poor life.” He prayed for the salvation of the Queen and country. Execution of sentence on a notorious highwayman had been appointed for the same time, but at a different place — perhaps to draw the crowds away — and yet many came to witness Southwell’s death. Eyewitness accounts, both Catholic and Protestant, are unanimous in describing Southwell as both gracious and prayerful in his final moments. When cut loose from the halter that tied him to the cart, he wiped his brow with a handkerchief and tossed the “sudarium” into the crowd, the first of what would become his relics. When asked if he would like to speak, Southwell crossed himself and first spoke in Latin, quoting Romans 14:8:“Sive uiuimus, Domino uiuimus, sive morimur, Domino morimur, ergo uiuimus, sive morimur, Domini sumus.” (If we live, we live in the Lord. If we die, we die in the Lord. Therefore, whether we live or we die, we are in the Lord.) The sheriff made to interrupt him; but, was allowed to continue for some time. He then addressed himself to the crowd, saying he died a Catholic and a Jesuit, offenses for which he was not sorry to die. He spoke respectfully of the Queen, and asked her forgiveness, if she had found any offense in him. At the third utterance of these words, the cart rolled away and Southwell hung from his neck. Those present forbade the hangman cutting him down to further the cruelties of drawing and quartering before Southwell was dead. He hung in the noose for a brief time, making the sign of the cross as best he could. As the executioner made to cut him down, in preparation for disembowelling him while still alive, Lord Mountjoy and some other onlookers tugged at his legs to hasten his death. Yet, despite their efforts, according to one account, he was still breathing when cut down. When the hangman lifted Southwell’s head up before the crowd, no one cried “Traitor.” Even a pursuivant present admitted he had never seen a man die better. Southwell’s writings, both in prose and verse, were extremely popular with his contemporaries, and his religious pieces were sold openly by the booksellers though their authorship was known. Imitations abounded, and Ben Jonson declared of one of Southwell’s pieces, The Burning Babe (below), that to have written it he would readily forfeit many of his own poems. 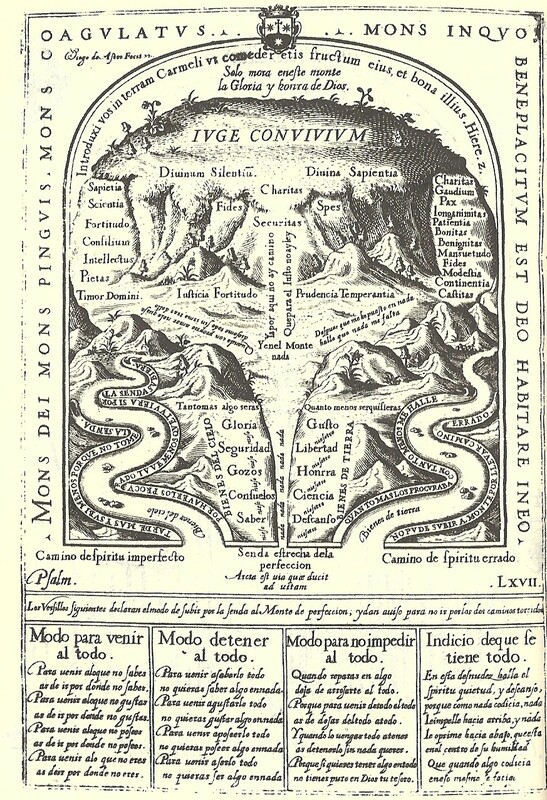 Mary Magdalene’s Tears, the Jesuit’s earliest work, licensed in 1591, probably represents a deliberate attempt to employ in the cause of piety the euphuistic prose style, then so popular. Triumphs over Death, also in prose, exhibits the same characteristics; but this artificiality of structure is not so marked in the Short Rule of Good Life, the Letter to His Father, the Humble Supplication to Her Majesty, the Epistle of Comfort and the Hundred Meditations. Southwell’s longest poem, St. Peter’s Complaint (132 six-line stanzas), is imitated, from the Italian Lagrime di S. Pietro of Luigi Tansillo. This with some other smaller pieces was printed, with license, in 1595, the year of his death. Another volume of short poems appeared later in the same year under the title of Maeoniae. Perhaps no higher testimony can be found of the esteem in which Southwell’s verse was held by his contemporaries than the fact that, while it is probable that Southwell had read Shakespeare, it is practically certain that Shakespeare had read Southwell and imitated him. -Line engraving by Matthaus Greuter (Greuther) or Paul Maupin, published 1608, frontispiece to St Peter’s Complaint. “The Chief Justice asked how old he was, seeming to scorn his youth. He answered that he was near about the age of our Saviour, Who lived upon the earth thirty-three years; and he himself was as he thought near about thirty-four years. Hereat Topcliffe seemed to make great acclamation, saying that he compared himself to Christ. Mr. Southwell answered, ‘No he was a humble worm created by Christ.’ ‘Yes,’ said Topcliffe, ‘you are Christ’s fellow. '”—Father Henry Garnet, “Account of the Trial of Robert Southwell.” Quoted in Caraman’s The Other Face, page 230. Southwell: I am decayed in memory with long and close imprisonment, and I have been tortured ten times. I had rather have endured ten executions. I speak not this for myself, but for others; that they may not be handled so inhumanely, to drive men to desperation, if it were possible. Topcliffe: If he were racked, let me die for it. Southwell: No; but it was as evil a torture, or late device. Southwell: Thou art a bad man. Topcliffe: I would blow you all to dust if I could. Southwell: What, soul and body too? With which His tears were fed. Which tumbleth from the tops where snow is thaw’d. And chase away dame Pleasure’s vain reliefs. Delights, adieu! I harbour’d you too long. “We therefore are under an obligation to be the light of the world by the modesty of our behaviour, the fervour of our charity, the innocence of our lives, and the example of our virtues. Also known as the “Common Doctor/Doctor Communis”, which is high praise, meaning his opine is universal, something for everyone, relevant in every situation. It is very moving for me. My mother always taught me to genuflect on both knees when the Blessed Sacrament is exposed. The altar is then stripped and ornamentation in the sanctuary is removed in anticipation of the events remembered the following day. There is such a peace, solemnity, silence, and profound meaning beyond words I look forward to each year. I tried reading the Summa on my own, once, and only once. Emphasis on the word “tried” and “once”. I quickly gave up. Calculus is easier, more self-evident. St. Thomas Aquinas was born January 28, 1225, in Aquino, a town in southern Italy from which he takes his surname. In his masterwork, Summa Theologica, he represents the pinnacle of Scholasticism, the philosophical and theological school that reconciles faith with reason and the works of Aristotle with the scriptures. At the time Thomas lived, the works of Aristotle were being rediscovered in the West and great Christian thinkers of the day spent a good deal of attention and effort trying to unify Divine revelation with human philosophy. In the East, intellectual life flourished. The West was still recovering from the inertia of the “Dark Ages”, where little intellectual innovation occurred. It is said St Thomas was the spark who prepared the the West for the Renaissance. Aristotle had been preserved in Arabic, and Islam was producing great Aristotelian thinkers. Western Christians needed to respond in kind. The family of Thomas Aquinas was a noble one, his parents, the Count of Aquino and Countess of Teano, were related to Emperors Henry VI and Frederick II, as well as to the Kings of Aragon, Castile, and France. He was the youngest of eight children. Because of his high birth, Thomas’ entry into the Dominican order in the early 1240s was very surprising, and especially disturbing to his family. They especially opposed entry into “mendicant”, or begging orders, who beg for their sustenance, thinking it far below their family status. Thomas’ family employed various means to dissuade him from his vocation, including kidnapping him and imprisoning him for two years. Thomas spent his time tutoring his sisters, and communicating with other Dominicans. His resolve was strong. Family members became desperate to dissuade Thomas, who remained determined to join the Dominicans. At one point, two of his brothers resorted to the measure of hiring a prostitute to seduce him. Thomas drove her away wielding a fire iron. That night two angels appeared to him as he slept and strengthened his determination to remain celibate giving him a mystical belt of chastity. He never faced sexual temptation again. (????!!!! Really? Wow? :< I guess. Mixed feelings on that one…. 🙂 [I DO like my sin, unfortunately. 🙁 Give me strength, Lord! :] Concupiscence. After a stint as a student in Paris, Thomas made his way to Cologne to teach, receiving ordination to the priesthood in 1250. 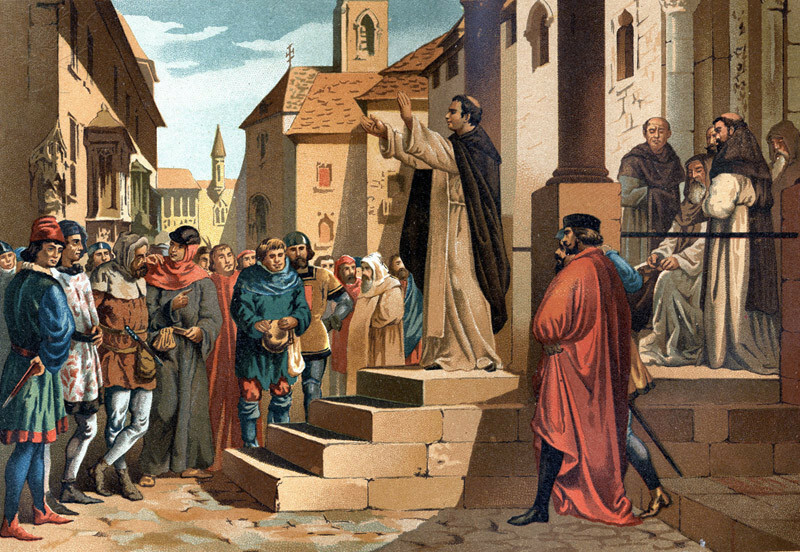 Soon after this, he was assigned to teach at Paris, where he also worked toward his degree of Doctor of Theology, which he received in 1257, with his friend St. Bonaventure, after some intramural political difficulty. When St. Thomas Aquinas’ confessor, Father Reginald of Piperno, urged him to keep writing, Aquinas replied, “I can do no more. Such secrets have been revealed to me that all I have written now appears to be of little value, as so much straw.” St. Thomas Aquinas never wrote again. The Summa Theologica was left unfinished, proceeding only as far as the ninetieth question of the third part. St. Thomas Aquinas died a few months later, on March 7, 1274. Today, Thomist theology stands at the center of the Roman Catholic tradition. 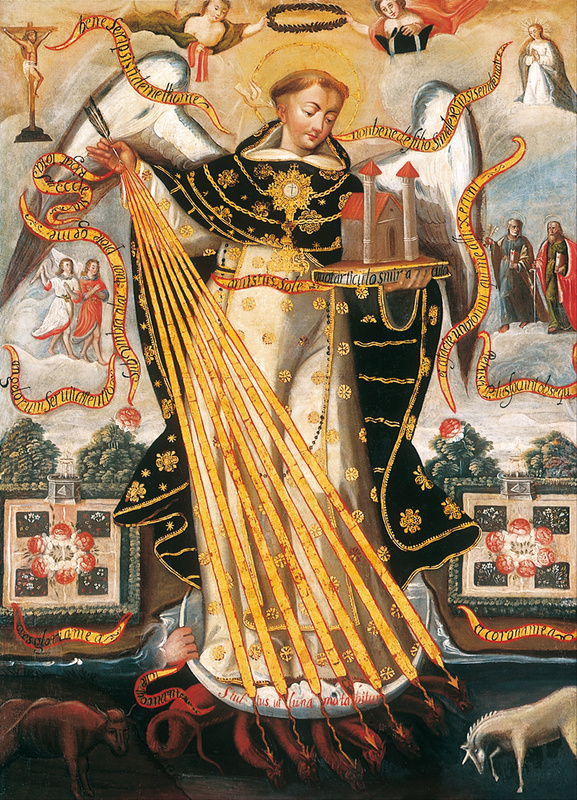 – artist anonymous, Cusco School, (1690 – 1695), “Saint Thomas Aquinas, Protector of the University of Cusco”, oil on canvas, H:1,610 mm (63.39 in), W:1,170 mm (46.06 in), Museo de Arte de Lima, Peru. Wonderful Theologian and Doctor of the Church, you learned more from the Crucifix than from books. Combining both sources, you left us the marvelous “Summa” of theology, broadcasting most glorious enlightenment to all. You always sought for true light and studied for God’s honor and glory. Help us all to study our religion as well as all other subjects needed for life, without ambition and pride in imitation of you. Amen. 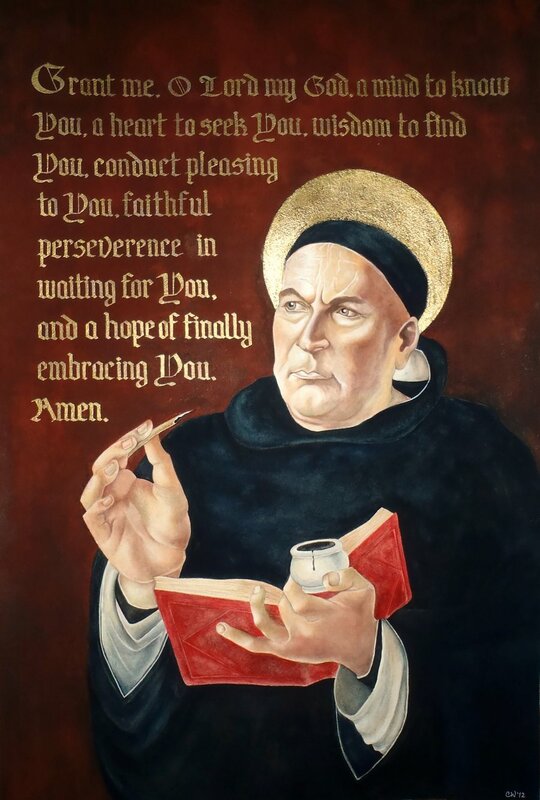 Father of wisdom, You inspired Saint Thomas Aquinas with an ardent desire for holiness and study of sacred doctrine. Help us, we pray, to understand what he taught, and to imitate what he lived. Amen. I love Pilate’s question. “What is Truth?” (Jn 18:38), asked by so many in our own day, or not. I have spent a VERY LONG TIME praying on THAT ONE!!!! I still do. I will until breath or thought are no longer mine. Rather than seek out and admit to Truth, the burden of Which is tremendous in its implications and responsibilities for us, many shrink/cower in fear or laziness and become their own truth, their own god, saying falsely, “There is no God.” Or, “God is Whom I wish Him to be.” In Gen 3:5, the effects of the deception of the serpent persist. Not only did Adam & Eve not become like God, we still believe we know, inherently, as a matter of fact, of and from our own reference of ourselves, our own whims, preferences, fashions and passions, a self-idolatry, the difference between Good & Evil. Untrue. An intellectual idol if ever there was one, not of silver or gold, but of self-satisfaction and reassurance. Safe, warm, self-satisfied, self-established, self-proclaimed, self-determined, self-assured, and false. Heresy. Psalm 135:15-18. No. One of the defining qualities of the True God is He is utterly transcendent. We do not define Him, in any way, form, or iota, nor, be forewarned and wary, should we ever be tempted to try. He defines us. He does not need us. We need Him, desperately. Classical catechesis teaches us if God ever stopped thinking about us, we would vanish into nothingness. All Creation exists because of and holds/remains because of the mindfulness of God. He loves us, surely, but voluntarily loves us; the only true love, and utterly not out of some necessity. That would be some sort of co-dependency. And I am unaware God is co-dependent. After the Resurrection, and even with the compilation, eventually, of the canon of Scripture, i.e., Council of Carthage, 397 AD, there were still many practical questions those wishing to live the Christian faith reasonably had. Details, details, details. Details are important. If, as the conventional wisdom goes, it is all about relationships, then details matter. How would your most important relationships fare without the intimate details/”history” those relationships are based upon? Not so well, I confidently posit. And so, it goes with God, in that most important Relationship, upon which all depends, details matter. Don’t get the details right and the Relationship is askew, misdirected, misinformed, misshapen, misunderstood, ineffective, failing or failed. You don’t “get It!” The very definition of sin is being out of right Relationship with God, of not “getting it”, not rendering, as justice demands, as a creature of the Creator, just worship and love for the fact of even just being. While the Church certainly faces its challenges in our own day, the first thousand years of Christianity were plagued by, among others, Arianism. Arianism was a belief created by Arius, Bishop of Alexandria AD 250–336, in Alexandria, Egypt, concerning the relationship of God the Father to God the Son, essentially denying the equality in divinity of Jesus to His Father. Arius asserted that the Son of God was a subordinate entity to God the Father. 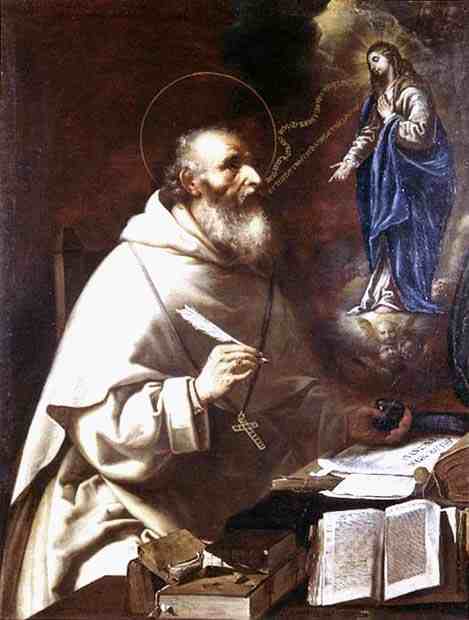 Arius was condemned as a heretic. Hilary was a gentle and courteous man, devoted to writing some of the greatest theology on the Trinity, and was like his Master in being labeled a “disturber of the peace.” In a very troubled period in the Church, his holiness was lived out in both scholarship and controversy. Hilary was born in Poitiers, France, at the beginning of the fourth century. In the early centuries of Christianity, paganism, of course, was prevalent. Hilary’s family was pagan, as was Hilary, by birth. He married and raised a family. His daughter’s name was Apra. Receiving an excellent education, Hilary, though, was drawn to the study of Scripture. Hilary learned that, from studying Scripture, a person should practice patience, kindness, justice and as many good habits as possible. These good acts would be rewarded in the life after death. Hilary’s studies also convinced him that there could only be One God Who is eternal, all-powerful and good. He read the Bible continuously. When he came to the story of Moses and the burning bush, Hilary was very impressed by the name God gave himself: I AM WHO AM. Hilary read the writings of the prophets, too. Then he read the whole New Testament. By the time he finished, Hilary was completely converted to Christianity, and he asked to be baptized. Hilary lived the faith so well that he was appointed bishop, against his personal wishes. This did not make his life easy because the Roman Emperor was interfering in Church matters. When Emperor Constantius ordered all the bishops of the West to sign a condemnation of St Athanasius, the great defender of the faith in the East, Hilary refused and was banished from France to far off Phrygia (in modern-day Turkey). Eventually Hilary was called the “Athanasius of the West.” It was then when Hilary’s great virtues of patience and courage stood out. 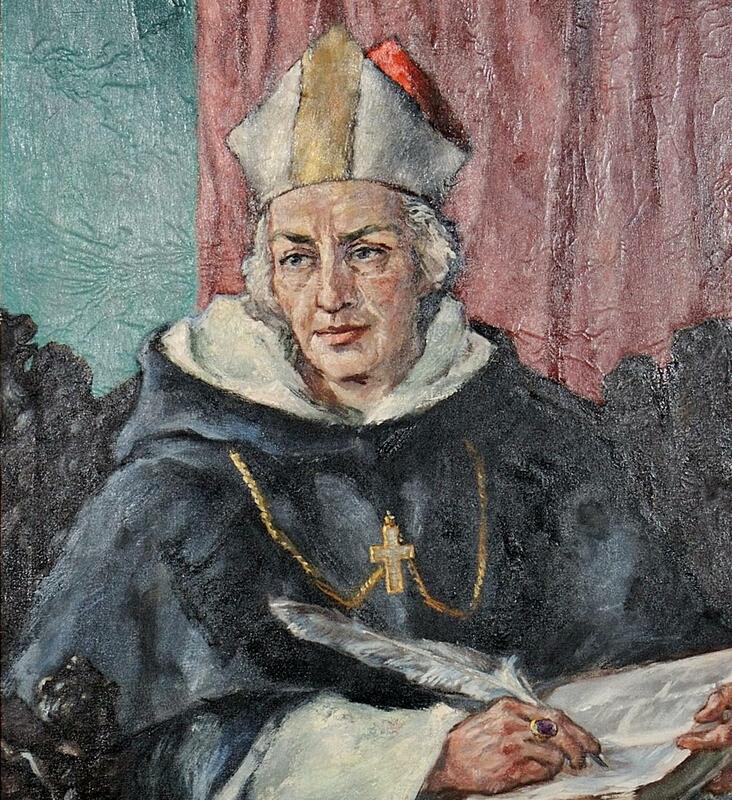 He accepted exile calmly and used the time to write books explaining the Catholic faith. While writing in exile, he was invited by some semi-Arians (hoping for reconciliation) to a council the emperor called to counteract the Council of Nicea, where the true Catholic doctrine of the Trinity was affirmed and defined. Hilary predictably defended the Church, and when he sought public debate with the heretical bishop who had exiled him, the Arians, dreading the meeting and its outcome, pleaded with the emperor to send this troublemaker back home, where they hoped he would receive less notoriety. Since he was becoming famous, Hilary’s enemies asked the emperor to send him back to his home in France. They hoped that people would pay less attention to him there. So Hilary was sent back to Poitiers in 360. He was received at home with great joy by the people of Poitiers. He continued writing and teaching about the Faith. Hilary died eight years later, at the age of fifty-two. His books have influenced the Church right to our own day. “I am well aware, almighty God and Father, that in my life I owe you a most particular duty. It is to make my every thought and word speak of You. In fact, You have conferred on me this gift of speech, and it can yield no greater return than to be at Your service. It is for making You known as Father, the Father of the only-begotten God, and preaching this to the world that knows You not and to the heretics who refuse to believe in You. In this matter the declaration of my intention is only of limited value. For the rest, I need to pray for the gift of Your help and Your mercy. As we spread our sails of trusting faith and public avowal before You, fill them with the breath of Your Spirit, to drive us on as we begin this course of proclaiming Your Truth. We have been promised, and He who made the promise is trustworthy: Ask, and it will be given to you; seek, and you will find; knock, and it will be opened to you. Yes, in our poverty we will pray for our needs. We will study the sayings of your prophets and apostles with unflagging attention, and knock for admittance wherever the gift of understanding is safely kept. But Yours it is, Lord, to grant our petitions, to be present when we seek You and to open when we knock. There is an inertia in our nature that makes us dull; and in our attempt to penetrate Your truth we are held within the bounds of ignorance by the weakness of our minds. Yet we do comprehend divine ideas by earnest attention to Your teaching and by obedience to the Faith which carries us beyond mere human apprehension. So we trust in You to inspire the beginnings of this ambitious venture, to strengthen its progress, and to call us into a partnership in the spirit with the prophets and the apostles. To that end, may we grasp precisely what they meant to say, taking each word in its real and authentic sense. For we are about to say what they already have declared as part of the mystery of revelation: that you are the eternal God, the Father of the eternal, only-begotten God; that You are one and not born from another; and that the Lord Jesus is also one, born of You from all eternity. We must not proclaim a change in Truth regarding the number of gods. We must not deny that He is begotten of You Who are the One God; nor must we assert that He is other than the true God, born of You, who are truly God the Father. Impart to us, then, the meaning of the words of Scripture and the light to understand it, with reverence for the doctrine and confidence in its Truth. Grant that we may express what we believe. Through the prophets and apostles we know about You, the One God the Father, and the One Lord Jesus Christ. May we have the grace, in the face of heretics who deny You, to honor You as God, Who is not alone, and to proclaim this as Truth.” -from a sermon On the Trinity (Lib 1, 37-38: PL 10, 48-49) by Saint Hilary of Poitiers. This prayer is used in the Roman Office of Readings for the feast of St. Hilary of Poitiers. 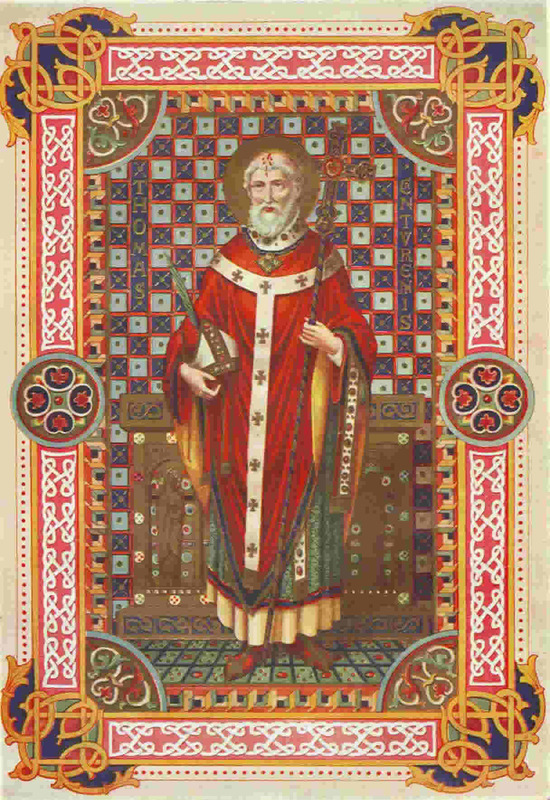 O Lord our God, Who raised up Your servant Hilary to be a champion of the Catholic faith: Keep us steadfast in that true faith which we professed at our baptism, that we may rejoice in having You for our Father, and may abide in your Son, in the fellowship of the Holy Spirit; Who live and reign for ever and ever. Amen. 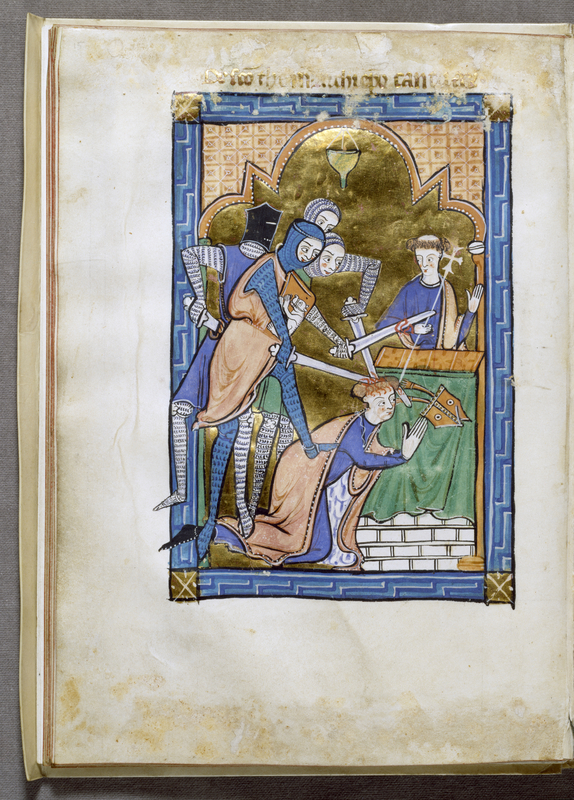 -miniature from an English psalter presenting a spirited account of the murder, c. 1250, Walters Art Museum, Baltimore. Three of the four knights attack the archbishop, who is kneeling in prayer before the altar. One of the knights kicks Thomas to the floor, and sends his miter flying as his sword cracks open Thomas’s head. A St Thomas, Chancellor of the Realm, killed at the order of his former friend King Henry, where they had previously been dear friends and true confidants, separated by a matter of principle and duty to the Church and its Lord; does history repeat itself? Perhaps. But, this is the twelfth century, not the sixteenth. Certainly, the ancients, and some even up to the twentieth century, believed history is cyclical, not linear, as we do. 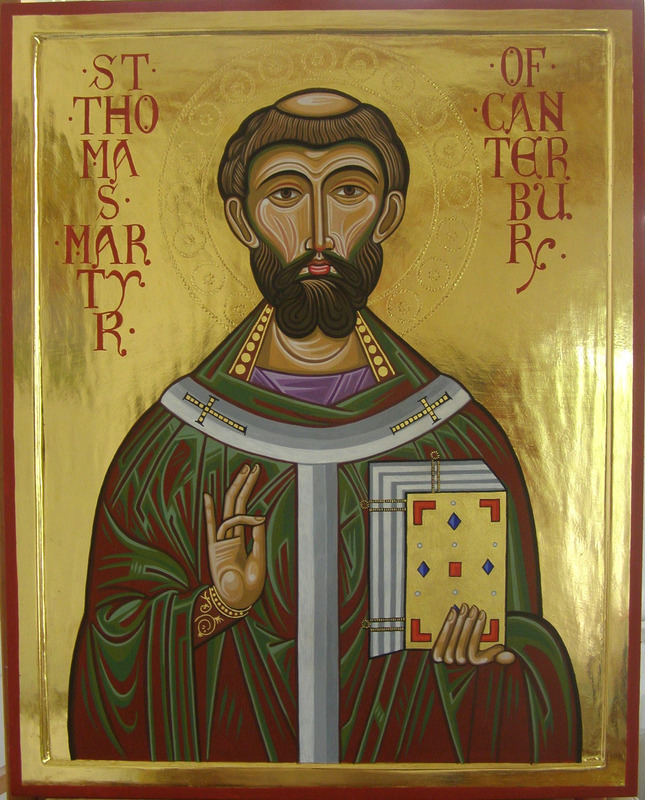 Thomas Becket was born of parents who had emigrated from Normandy to England, some years before his birth 21 Dec 1118. He was well educated and associated with the social elite of his day. “To look upon he was slim of growth and pale of hue, with dark hair, a long nose, and a straightly featured face. Blithe of countenance was he, winning and love-able in his conversation, frank of speech in his discourses, but slightly stuttering in his talk, so keen of discernment and understanding that he could always make difficult questions plain after a wise manner.” He abhorred foul conduct and speech. Lying and unchastity were hateful to him. He came into the employ and favor of the then Archbishop of Canterbury for his secretarial skills. He was subsequently sent by his employer to study civil and canon (church) law in Bologna and Auxerre, and handle several delicate negotiations of import. It was at this time that Henry II ascended the throne. Henry had been made aware of Thomas’ reputation and subsequently made him his chancellor. As chancellor of England, Thomas had a large household and lived in splendor. Current chroniclers speak with wonder of the relations which existed between the chancellor and the sovereign, who was twelve years his junior. People declared that “they had but one heart and one mind”. Often the king and his minister behaved like two schoolboys at play. But although they hunted or rode at the head of an army together it was no mere comradeship in pastime which united them. Both were hard workers, and both, we may believe, had the prosperity of the kingdom deeply at heart. When the archbishop of Canterbury died, Henry wanted the pope to give Thomas this position. It would require that Thomas be ordained a priest. But Thomas told him plainly that he did not want to be the archbishop of Canterbury. He realized that being in that position would put him in direct conflict with Henry II’s plans to control and manipulate the Church towards his own ends. Thomas knew that he would have to defend the Church against Henry, and that would mean trouble. “Your affection for me would turn into hatred,” he warned Henry. The king paid no attention and Thomas was made a priest and a bishop in 1162. Now a change occurred. Thomas lived more austerely and devoted much more time to prayer. At first, things went along as well as ever. All too soon, however, the king began to demand money, which Thomas felt he could not rightly take from the Church. The king grew more and more angry with his former friend. Finally, he began to treat Thomas harshly. For a while, Thomas was tempted to give in a bit to the “Constitutions of Clarendon”, which enumerated Henry’s proposed abuses. Then he began to realize just how much Henry hoped to control the Church. Thomas was very sorry that he had even thought of giving in to the king. He did penance for his weakness and ever after held firm. Some of his knights took him literally. They went off to murder the archbishop. They attacked him in his own cathedral, trying to remove him from the physical church building, but Thomas resisted, struggling and dying on the steps of the altar. A sword blow scattering his brains on the cathedral floor. He died, saying, “For the name of Jesus and in defense of the Church, I am willing to die.” It was December 29, 1170. “Then the unconquered martyr seeing the hour at hand which should put an end to this miserable life and give him straightway the crown of immortality promised by the Lord, inclined his neck as one who prays and joining his hands he lifted them up, and commended his cause and that of the Church to God, to St. Mary, and to the blessed martry Denys. Scarce had he said the words than the wicked knight, fearing lest he should be rescued by the people and escape alive, leapt upon him suddenly and wounded this lamb who was sacrificed to God on the head, cutting off the top of the crown which the sacred unction of the chrism had dedicated to God; and by the same blow he wounded the arm of him who tells this. For he, when the others, both monks and clerks, fled, stuck close to the sainted Archbishop and held him in his arms till the one he interposed was almost severed. “Then the third knight inflicted a terrible wound as he lay, by which the sword was broken against the pavement, and the crown which was large was separated from the head. The fourth knight prevented any from interfering so that the others might freely perpetrate the murder. The entire Christian world was horrified at such a crime. Pope Alexander III held the king personally responsible for the murder. A year later, Henry II performed public penance, lest he be excommunicated and thereby removing his subjects of the obligation of fealty, and he lose his crown, and likely his life. There can only be one king. On 12 July, 1174, the king donned a sack-cloth walking barefoot through the streets of Canterbury while eighty monks flogged him with branches. Henry capped his atonement by spending the night in the martyr’s crypt. An immense number of miracles occurred at the tomb of St Thomas Becket, and for the rest of the Middle Ages the shrine of St. Thomas of Canterbury was one of the wealthiest and most famous in Europe. 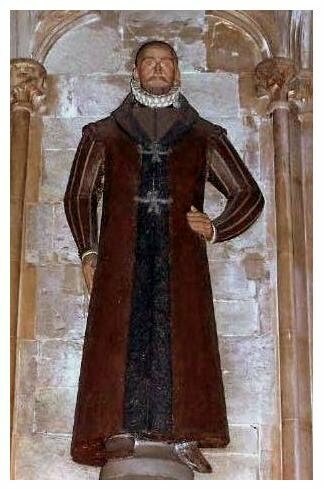 The martyr’s holy remains are believed to have been destroyed in September, 1538, when nearly all the other shrines in England were destroyed. Almighty God, by Whose grace and power Your holy martyr Thomas triumphed over suffering and evil, and was faithful even unto death, keep Thy household free of all evil. Raise up for us faithful pastors and shepherds, who are wise in the ways of the Gospel. Grant us, who now remember Your martyr Thomas with thanksgiving, to be so faithful in our witness to You in this world, that we may be a compelling sign of faith to those who witness our lives, and hence receive with Your martyrs the crown of life, through Jesus Christ our Lord, Who lives and reigns with You and the Holy Spirit, one God, for ever and ever. Amen. Swithun Wells was born at Brambridge, Hampshire, England around 1536; the youngest of five sons, his parents were Thomas Wells (or Welles) and Mary, daughter of John Mompesson. 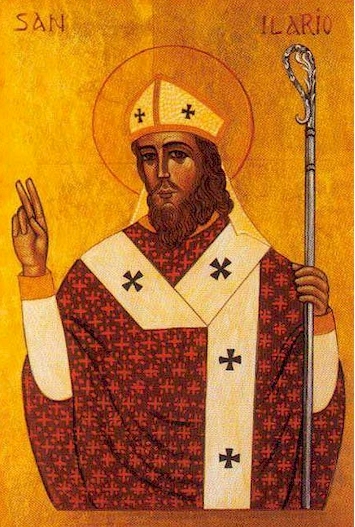 He was christened with the name of the ninth century local saint and Bishop of Winchester, Swithun. They were a determinedly Catholic family who, during the Reformation, were to assist in the clandestine burials of Catholics in the local churchyard and whose house became a refuge for priests. His eldest brother, Gilbert, died a known recusant having forfeited the property, but it was later restored to the family by Charles II. We know that for six years he kept a school for young gentlemen at Monkton Farleigh in Wiltshire and that for many years he conformed to the state requirement to attend Protestant services. In 1583, Swithun Wells was reconciled to the Catholic Church. In 1585 he went to London, where he took a house in Gray’s Inn Lane. November 7, 1591, Fr. Edmund Gennings (b. 1567) was saying Mass at Wells’s house, when the priest-hunter Richard Topcliffe burst in with his officers. They would all be executed outside that same house. Gennings, from Lichfield, Staffordshire, was a thoughtful, serious boy naturally inclined to matters of faith. At around sixteen years of age he converted to Catholicism. 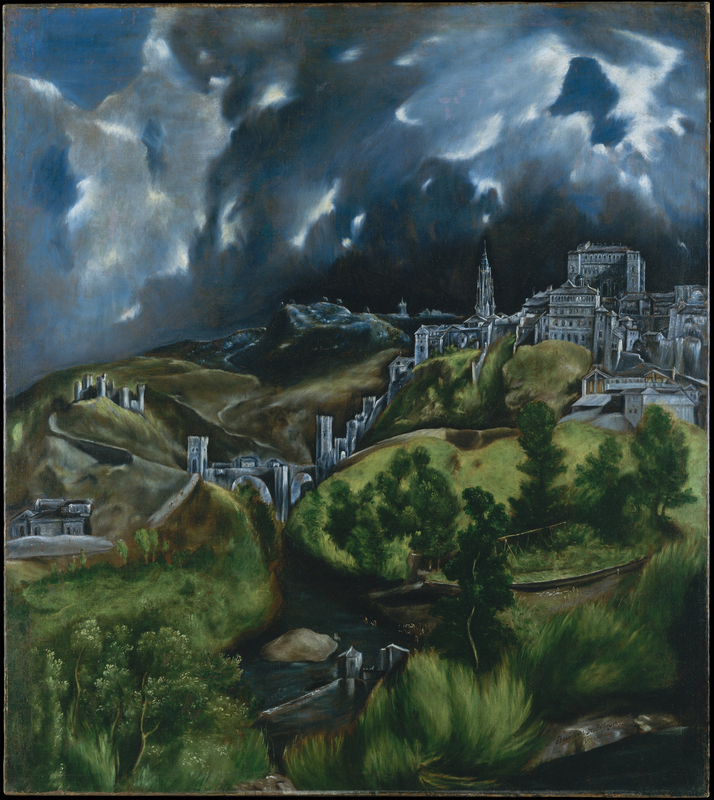 He went immediately to the English College at Reims where he was ordained a priest in 1590. He soon returned to England under the assumed name of Ironmonger. His missionary career was brief. Topcliffe, “the Queen’s Torturer”, “the cruelest tyrant in all of England”, was a lawyer in the employ of the Privy Council and a sadistic interrogator and torturer and a sexual sadist – a man, it is reported, who too much enjoyed his work. Topcliffe claimed that his own instruments and methods were better than the official ones, and was authorized to create a torture chamber in his home in London. The “Topcliffe Rack”, where the victim is suspended vertically, rather than horizontally, from a wall by manacles far above their height and weights are added to the ankles, was his invention. The congregation at Wells’ house, now surrounded, not wishing the Mass to be interrupted, held the door and beat back the officers until the Mass was finished, after which they all surrendered quietly. Wells was not present at the time, but his wife was, and was arrested along with Gennings, another priest, Fr. Polydore Plasden, and three laymen, John Mason, Sidney Hodgson, and Brian Lacey. On his return, Wells was immediately arrested and imprisoned. 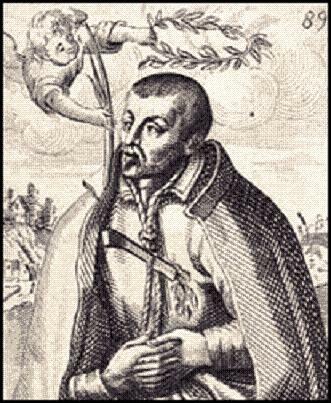 At his trial, he said that he had not been present at the Mass, but wished he had been, upon which saying he was sentenced to be hanged, and was executed outside his own house on 10 December 1591, just after Edmund Gennings. The victim the executioners most wanted to suffer most would be killed last, watching loved ones and friends die brutally before their own passion. Fr. Gennings, a convert to Catholicism at age 17, was killed first. He was 24 yrs old. He is reported to have said, “Sancte Gregori, ora pro me!” while he was being disembowelled, after being hung, but not to death, only stunning him, and that the hangman swore, “Zounds! See, his heart is in my hand, and yet Gregory is in his mouth. 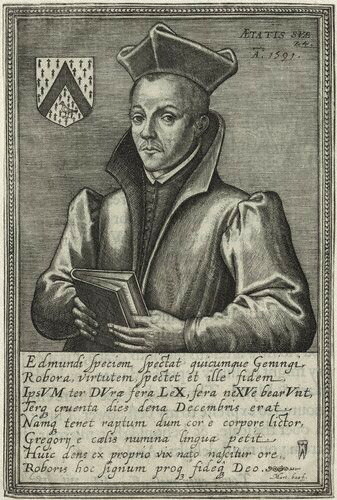 O egregious Papist!” The martyrdom of Edmund Gennings was the occasion of several extraordinary incidents, chief of which was the conversion of his younger brother, John, to the Catholic faith, and who became a Franciscan, and who later wrote his biography, published in 1614 at Saint-Omer. Fr. Polydore Plasden, age 28, at his execution he acknowledged Elizabeth as his lawful queen, whom he would defend to the best of his power against all her enemies, and he prayed for her and the whole realm, but said that he would rather forfeit a thousand lives than deny or fight against Catholicism. In contrast to the others, Sir Walter Raleigh fought for his reprieve, but only succeeded in his being allowed to hang till he was dead, and the sentence was carried out upon his corpse. It was upon Fr. Plasden’s word that the Mass they attended and for which they were about to die was allowed to conclude peacefully. Due to Fr. Plasden’s concern for the Blessed Sacrament and his fear that the Eucharist might be subjected to sacrilege, he gave his word that he, Fr. Edmund Gennings and those recusants hearing Mass would freely surrender should Mass be permitted to conclude. The infamous Richard Topcliffe knew that Fr. Polydore would keep his word and agreed so as to be able to take them away quietly. The message here is clear. The Mass is the priority. Once concluded, do with us what you wish. On the scaffold, Swithun Wells, said to Topcliffe, “Hurry up, please, Mr. Topcliffe. Are you not ashamed to make a poor old man stand in his shirt in the cold? God pardon you and make you of a Saul into a Paul, of a bloody persecutor into one of the Catholic Church’s children. By your malice I am thus to be executed, but you have done me the greatest benefit that ever I could have had. I heartily forgive you.” ” His wife, Alice, was reprieved, and died in prison some 10 years later. “If to return to England a priest or to say Mass be popish treason, I here confess that I am a traitor; but I think not so and therefore acknowledge myself guilty of this those, not with repentance but with an open protestation of inward joy!” – St Edmund Gennings, priest & martyr, executed age 24. Eternal and loving God, the lives of your servants, Swithun Wells and his companions, offer us an example of faithful service to the Gospel and love for the Mass. Their deaths remind us of the cost that many people pay for witnessing to the Truth. may we be proud of the faith we have inherited from the saints and martyrs, and through our work, prayers, and most importantly Your grace, deepen the roots of the Catholic faith in ourselves and in those who observe our lives. We ask this through Jesus Christ, your Son. Kelly, Mara, and I have found our new parish home in St Albert the Great, O.P. of Sun Prairie, WI, stalberts.org; sister parish of Sacred Hearts of Jesus & Mary Parish also in Sun Prairie. We have hopes Mara may attend Sacred Hearts School. The fact I am a professional applied scientist and a former Dominican novice is not lost on me in this serendipitous coincidence. The Midwestern Province of the Order of Preachers is dedicated to St Albert the Great, O.P. We are happy and St Albert’s is a happy place of fellow pilgrims. He was known as the “teacher of everything there is to know,” was a scientist long before the age of science, became the teacher and mentor of that other remarkable mind of his time, St. Thomas Aquinas. St. Albert the Great was born in Lauingen on the Danube, near Ulm, Germany; his father was a military lord in the army of Emperor Frederick II. As a young man Albert studied at the University of Padua and there fell under the spell of Blessed Jordan of Saxony, the Dominican who made the rounds of the universities of Europe drawing the best young men of the universities into the Dominicans. After several teaching assignments in his order, he came in 1241 to the University of Paris, where he lectured in theology. While teaching in Paris, he was assigned by his order in 1248 to set up a house of studies for the order in Cologne. In Paris, he had gathered around him a small band of budding theologians, the chief of whom was Thomas Aquinas, who accompanied him to Cologne and became his greatest pupil. In 1260, he was appointed bishop of Regensberg; when he resigned after three years, he was called to be an adviser to the pope and was sent on several diplomatic missions. In his latter years, he resided in Cologne, took part in the Council of Lyons in 1274, and in his old age traveled to Paris to defend the teaching of his student Thomas Aquinas. It was in Cologne that his reputation as a scientist grew. He carried on experiments in chemistry and physics in his makeshift laboratory and built up a collection of plants, insects, and chemical compounds that gave substance to his reputation. When Cologne decided to build a new cathedral, he was consulted about the design. He was friend and adviser to popes, bishops, kings, and statesmen and made his own unique contribution to the learning of his age. 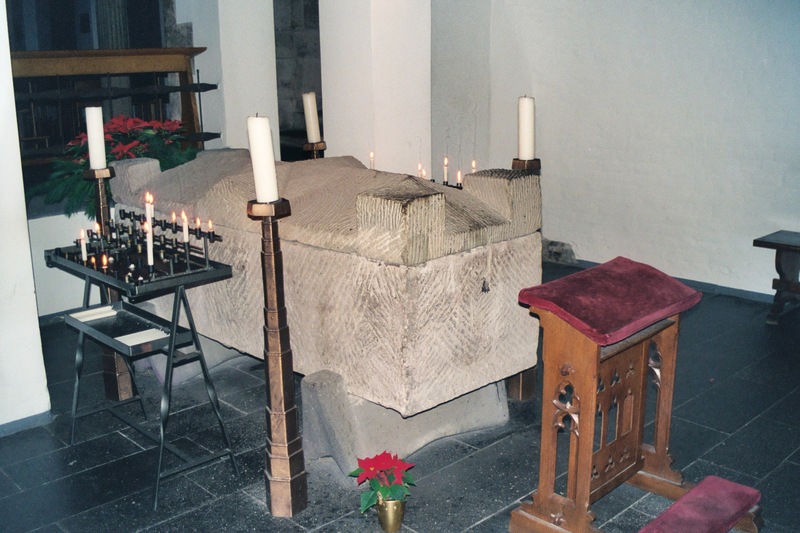 He died a very old man in Cologne on November 15,1280, and is buried in St. Andrea’s Church in that city. He was canonized and declared a Doctor of the Church in 1931 by Pope Pius XI. His writings are remarkable for their exact scientific knowledge, and for that reason he has been made the patron saint of scientists. St. Albert the Great, O.P., was convinced that all creation spoke of God and that the tiniest piece of scientific knowledge told us something about Him. Besides the Bible, God has given us the book of creation revealing His wisdom and power. In creation, Albert saw directly and undeniably the hand of God and His love of mankind. “Do this in remembrance of me.” Two things should be noted here. The first is the command that we should use this sacrament, which is indicated when Jesus says, “Do this.” The second is that this sacrament commemorates the Lord’s going to death for our sake. This sacrament is profitable because it grants remission of sins; it is most useful because it bestows the fullness of grace on us in this life. “The Father of spirits instructs us in what is useful for our sanctification.” And his sanctification is in Christ’s sacrifice, that is, when He offers Himself in this sacrament to the Father for our redemption to us for our use. Prayer to St Albert the Great, O.P. Dear scientist and Doctor of the Church, natural science and sacred science were for you the same Truth. For you, and for all Catholic scientists, these are never in opposition, but always in harmony – one beckoning deeper understanding of the other, drawing humankind more deeply into the infinitely knowable mystery of the Creator and His Word. Though you had an encyclopedic knowledge, it never made you proud, for you regarded it as a gift of God. Inspire scientists, theoretical and applied, to use their gifts well in studying the wonders of creation, thus bettering the lot of the human race and rendering greater glory to God. Amen. As the national debate wrangles/rages on with regards to undocumented persons in this country, I took a pilgrimage recently. Probably the shortest pilgrimage anyone could take. Just a few blocks up Lake Shore Drive. You know I couldn’t pass this up, don’t you? St Frances Cabrini was small in stature, and poor in health most of her life. Yet, this petite immigrant nun founded sixty-seven institutions of care and support for immigrants in the US, Europe, and Central and South America, in her sixty-seven years of life. A CEO and entrepreneur if God ever needed one, and those hospitals, schools, and orphanages she established which benefited countless people in need certainly did. An able leader in time of need who responded in faith. “I can do all things through Him, Who strengthens me!” (Phil 4:13) Omnia possum in eo qui me confortat! was her constant motto. Francesca was born on July 15, 1850, in Sant’Angelo Lodigiano, Lombardy, Italy, one of eleven children from Agostino Cabrini and Stella Oldini who were rich cherry tree farmers. Sadly only four of the eleven survived beyond adolescence. Small and weak as a child, born two months premature, she remained in delicate health throughout her life. As a child growing up in Italy, she dreamed about being a missionary to China. She sailed paper boats down a stream, pretending they were ships bringing missionaries to China. She also gave up eating candy because, she reasoned, if she lived in China, she probably wouldn’t be able to have any. When she grew up, Frances tried to join two different convents. Because of her poor health, she was not accepted. She taught school for a while. Then a priest asked her to help out in a small home for orphans. Things were very hard for Frances because of the lady who ran the house. Eventually, the bishop had to close the orphanage because of this difficult woman. Ah, people. God gives us each other to help us all grow in holiness. How sad if we misunderstand this or miss the chance. One bite at the apple, as lawyers say, but we always, with the exception of saints, do. I do. Constantly. At the same time, this same priest who asked Frances to help at the orphanage asked her to begin a community of sisters dedicated to teaching. Without hesitating, Frances started at once. Before long, the Congregation of the Missionary Sisters of the Sacred Heart began to grow, first in Italy and then in many other countries. Frances, whom everyone called Mother Cabrini, had always had her heart set on going to China, but it seemed that God wanted her to go to America instead. When Pope Leo XIII told her, “Go West, not East,” the matter was settled. 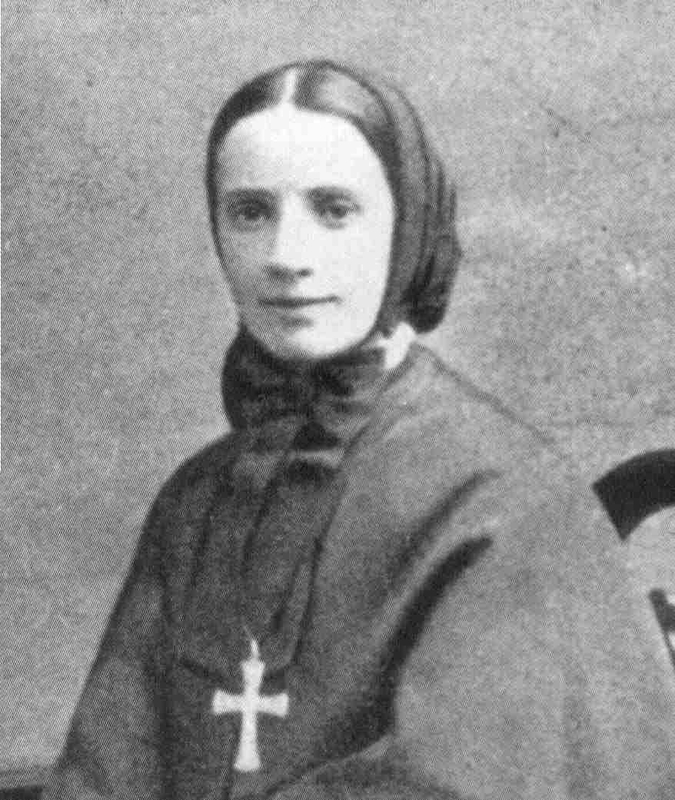 St. Frances Xavier Cabrini sailed for the United States and became an American citizen. She especially helped large numbers of Italian immigrants. She was a real mother and friend to them. Mother Cabrini and her sisters had a very hard time in the beginning. The archbishop of New York even suggested that they go back to Italy, since the house they anticipated would be available to them wasn’t when they arrived. When Mother Cabrini arrived on the North Side of Chicago more than a century ago, she set out to transform an old hotel into an orphanage. Instead, Archbishop James Edward Quigley asked her to open a hospital. Before leaving the city to travel the world, she had opened three. On Thursday, Nov 18, 2011, architects, developers and nuns in hard hats broke ground and unveiled plans to restore the national shrine to the first American citizen to be declared a saint at the site of the Columbus Hospital she founded and where she died of complications from dysentery while preparing Christmas candy for local children. In response to Mother Cabrini’s canonization in 1946, there was an overwhelming response of pilgrims to the room where she died in Chicago. 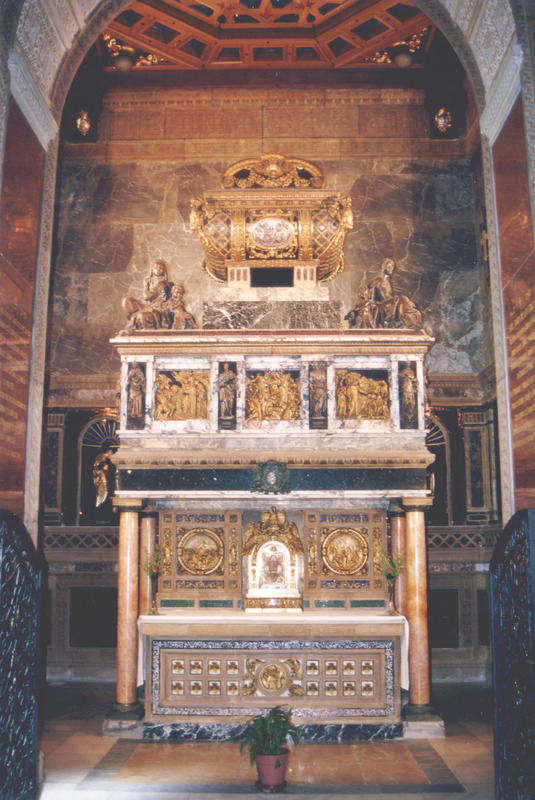 The shrine was built to accommodate them, and restored to us, today, an architectural gem of gold mosaics, Carrera marble, murals, and Florentine stained glass. 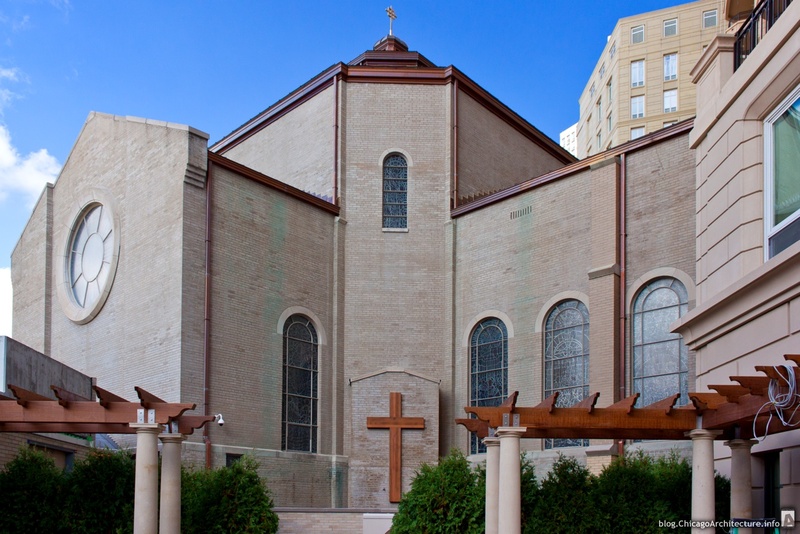 Boarded up and shrouded in scaffolding for nearly 10 years, the renovated National Shrine of Saint Frances Xavier Cabrini features a garden grotto as well as the original iron bed, dresser, kneeler and desk from the hospital room where the patron saint of immigrants died in 1917. The shrine, at 2520 N. Lakeview Ave., reopened to the public this Fall. “We need the shrine in order to remember her,” said the Rev. Ted Ploplis, coordinator of spiritual services at St. Joseph Hospital. Ploplis expects to become rector of the shrine. “She was the Mother Teresa of the century before this. She knew what God wanted her to do, and she did it. It’s important to have a place where we can really celebrate her life, tell her story and live her mission. She has wonderful things to teach us,” he said. Sister Joan McGlinchey, of the Missionary Sisters of the Sacred Heart of Jesus, the order founded by Mother Cabrini more than 130 years ago, said the shrine is intended to continue Mother Cabrini’s mission of helping the poor become productive members of society. Sealed after Mother Cabrini’s death to preserve the holy presence nuns believed filled the space, the room in which she died was reconstructed as an annex to the new Columbus Hospital’s chapel after the original building’s demolition in the late 1940s. For years after her canonization in 1946, pilgrims made their way to the shrine. 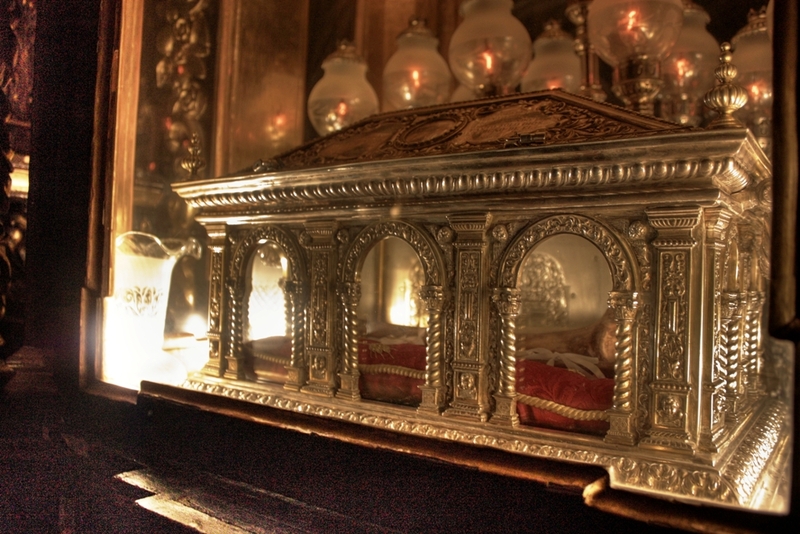 Mothers would place their infants on the iron bed as they prayed. It was restored to its original austerity in 1988. The annex and chapel were boarded up again when the property off Lakeview Avenue was purchased nearly 10 years ago. Construction on condominiums began in 2006. 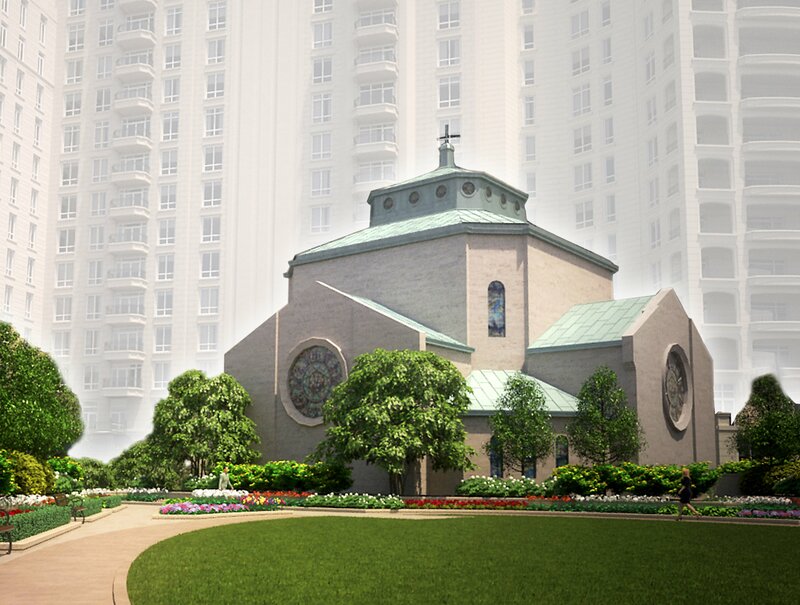 Originally a chapel for the Cabrini-founded Columbus Hospital, the shrine, at 2520 N. Lakeview Ave., had been closed since 2002 as construction crews built condominiums in place of the old medical buildings when the hospital property was sold to developers. The Missionary Sisters of the Sacred Heart of Jesus negotiated with the new owners of the property to preserve the shrine and chapel in the new development as a condition of sale. The Columbus Hospital had been built around the shrine and its church obscuring the building within the building from outside viewers. Now it is beautifully revealed. Dozens of nuns were on hand for the event, having flown in for the dedication from around the world. They said having the national shrine back in Chicago was important, as it kept a tangible reminder of Cabrini close to an area where she served. A two-hour rededication Mass night filled every pew with nuns, former hospital employees and local Catholics. Those in attendance said restoration crews did a nice job of preserving the character of the sanctuary while adding office space, exhibits about Cabrini and a spacious lobby. Michele Houser said she married her husband in the chapel. She picked the site because she worked as a physical therapist at Columbus Hospital. Seeing it reopened with its frescoes touched up and a grander entrance was special, she said. “It’s an exciting experience to be back here and have it restored so beautifully,” said Houser, who lives in Libertyville. Cardinal George did say he was glad to be back at the Cabrini Chapel, a place George said he first visited as a young boy when his cousin was hospitalized at Columbus and later frequented as a priest. Zanin agreed with George that the chapel was special, and she’s hopeful that it will inspire more people. You GO GIRL!!! With your GOOD-self!!! 🙂 YES, JESUS!!! Great St Frances Xavier Cabrini, through your missionary work you radiated great light to those in need. Yours was a simple way, a kindly way, yet you accomplished many great and small tasks. I ask that you help me to stay calm and unwavering in the pursuit of my own projects of compassion, love, and forgiveness of others, especially those whom may be difficult to love in my own family and community. Ask Him Who strengthened you to strengthen me. Mother Cabrini, bolster my faith in my many moments of doubt. Help me find the simple and sure way to Jesus, and serve Him as you did. Amen. With all the debate and pronouncements regarding the modern “definitions” of marriage & family, moral theology issues, etc., in my bewilderment and dismay, the only comfort I have found, the only thing that brings peace and makes sense, is to deepen my devotion to the Holy Family. Join me, please. And, through You, I make this offering to our Father in heaven. And assist me that it may become a worthy offering in every way. Be close to me in all I think and say and do. And that my works may be works I ask You to approve. To form me after the perfect fatherhood of God. To be presented to our Father in joy and love. 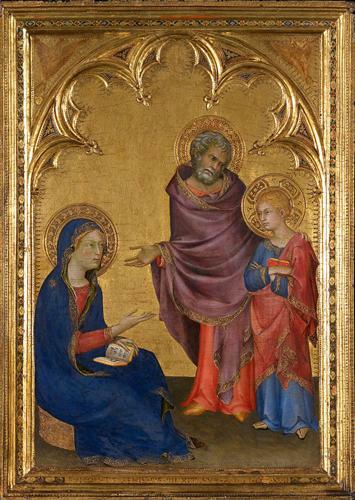 Good St Joseph, Head of the Holy Family, Patron of Husbands and of Fathers, Faithful Servant, Entrusted Guardian & Protector of our Lord: I, too, have been highly favored and blessed, entrusted with the care of soul and body of this Daughter of God as my life’s vocation. With you as my exemplar, ask your foster Son to grant me the graces always to faithfully fulfill my Christian duty as a husband and father until my own death. O, Good St Joseph, in thanksgiving and rejoicing for this great joy and honor God has bestowed upon me – to participate with Him as co-Creator of Life, I beg you to come to my assistance and pray for me! Be my constant advocate before the Throne of God in all my necessities and trials! Amen. Collect: O God, Who were pleased to give us the shining example of the Holy Family, graciously grant that we may imitate them in practicing the virtues of family life and in the bonds of charity, and so, in the joy of Your house, delight one day in eternal rewards. Through our Lord Jesus Christ, your Son, Who lives and reigns with You in the unity of the Holy Spirit, one God, for ever and ever. Amen. 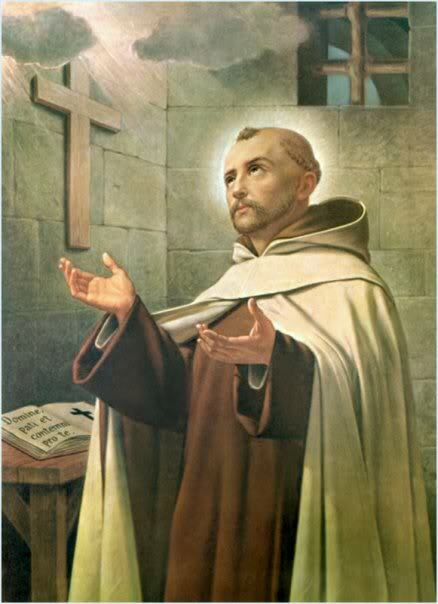 One of the Great Catholic Reformers, Saint John of the Cross (San Juan de la Cruz) (b: 24 June 1542 — d: 14 December 1591), born Juan de Yepes Alvarez of a Jewish converso family, was a major figure of the Catholic Reformation, a Spanish mystic, and Carmelite friar and priest, born at Hontoveros, Old Castile. John learned the importance of self-sacrificing love from his parents. His father gave up wealth, status, and comfort when he married a weaver’s daughter and was disowned by his noble family. After his father died, his mother kept the destitute family together as they wandered homeless in search of work. These were the examples of sacrifice that John followed with his own great love of God. John was a reformer and re-vitalizer of the Carmelite Order and is considered, along with Saint Teresa of Ávila, as a founder of the Discalced Carmelites. He is also known for his writings. Both his poetry and his studies on the growth of the soul are considered the summit of mystical Spanish literature and one of the peaks of all Spanish literature. Ordained a Carmelite priest at 25 (1567), John met Teresa of Jesus (Avila–October 15) and like her vowed himself to the primitive Rule of the Carmelites. As partner with Teresa and in his own right, John engaged in the work of reform, and came to experience the price of reform: increasing opposition, misunderstanding, persecution, imprisonment. Yet, the paradox! In this dying of imprisonment, John came to life, uttering poetry. In the darkness of the dungeon, John’s spirit came into The Light, paper he used to write on passed to him by one of his guards. There are many mystics, many poets; John is unique as mystic-poet, expressing in his prison-cross the ecstasy of mystical union with God in the “Spiritual Canticle”. The Church of England commemorates him, too, as a “Teacher of the Faith” on this same day. “Let Your divinity shine on my intellect by giving it divine knowledge, and on my will by imparting to it the divine love and on my memory with the divine possession of glory. Let us so act that by means of this loving activity we may attain to the vision of ourselves in Your beauty in eternal life. That is: That I be so transformed in Your beauty that we may be alike in beauty, and both behold ourselves in Your beauty, possessing now Your very beauty; this, in such a way that each looking at the other may see in the other his own beauty, since both are Your beauty alone, I being absorbed in Your beauty; hence, I shall see You in Your beauty, and You shall see me in Your beauty, and I shall see myself in You in Your beauty, and You will see Yourself in me in Your beauty; that I may resemble You in Your beauty, and You resemble me in Your beauty, and my beauty will be Your beauty and Your beauty my beauty; wherefore I shall be You in Your beauty, and You will be me in Your beauty, because Your very beauty will be my beauty; and therefore we shall behold each other in Your beauty. “Lord God, my Beloved, if You remember still my sins in suchwise that You do not do what I beg of You, do Your will concerning them, my God, which is what I most desire, and exercise Your goodness and mercy, and You will be known through them. And if it is that You are waiting for my good works so as to hear my prayer through their means, grant them to me, and work them for me, and the sufferings You desire to accept, and let it be done. But if You are not waiting for my works, what is it that makes You wait, my most clement Lord? Why do You delay? For if, after all, I am to receive the grace and mercy which I entreat of You in Your Son, take my mite, since You desire it, and grant me this blessing, since You also desire that. Who can free himself from the lowly manners and limitations if You do not lift him to Yourself, my God, in purity of love? How will a man begotten and nurtured in lowliness rise up to You, Lord, if You do not raise him with Your hand which made him? You will not take from me, my God, what You once gave me in Your only Son, Jesus Christ in Whom You gave me all I desire. Hence I rejoice that if I wait for You, You will not delay. With what procrastinations do You wait, since from this very moment you can love God in your heart? Mine are the heavens and mine is the earth. Mine are the nations, the just are mine, and mine the sinners. The angels are mine, and the Mother of God, and all things are mine; and God Himself is mine and for me, because Christ is mine and all for me.What do you ask, then, and seek, my soul? Yours is all of this, and all is for you. Do not engage yourself in something less, nor pay heed to the crumbs which fall from your Father’s table. Go forth and exult in your Glory! Hide yourself in It and rejoice, and you will obtain the supplications of your heart. 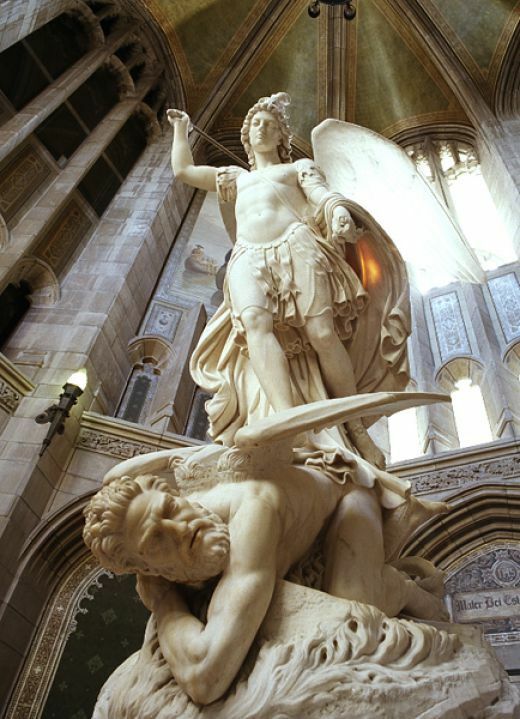 -by Scipione Tadolini, “St Michael the Archangel”, 1865, Marble sculpture, Rotunda, Gasson Hall, Boston College. The last thing the Enemy wishes is our despair. There is a story about Satan selling some of his tools at a garage sale he was giving. There on tables grouped by importance were his bright, shiny but deadly trinkets. One could find tools that made it easy to tear others down. And for those who had big egos, there were lenses for magnifying one’s own importance, but if you looked through them the other way, you could also use the lens to belittle others. An unusual assortment of gardening implements stood together with a guarantee to help your pride grow by leaps and bounds. Also in prominence was the rake of scorn, the shovel of jealousy for digging a pit for your neighbor, tools of gossip and backbiting, of selfishness and apathy. All of these were pleasing to the eye and came complete with great promises and guarantees of prosperity. The prices, of course, were steep but a sign declared “Free Credit Extended” to all. “Take at least one home, use it. You don’t have to pay until later!” old Satan cried rubbing his hands in glee. One prospective buyer was looking at all the things offered when he noticed two well-worn, non-descript tools standing in one corner. Not being nearly as tempting as the other items, he found it curious that these two tools had price tags higher than any other. Resist him, solid in your faith. We used to call this Spiritual Warfare. The Lord’s love is infinitely stronger than any evil. He is God. He cannot be defeated. The Prince of Lies wishes us to believe he can defeat Him. It is a lie. Do not listen to him. With the power of prayer and trust in the Lord, banish the Liar to the void of suffering from whence he came for his rebellion against God, to which he wishes to drag us all. Resist him, solid in your faith. By the intercession of St. Michael and the celestial Choir of Seraphim, may the Lord make us worthy to burn with the fire of perfect charity. Amen. By the intercession of St. Michael and the celestial Choir of Cherubim, may the Lord grant us the grace to leave the ways of sin and run in the paths of Christian perfection. Amen. By the intercession of St. Michael and the celestial Choir of Thrones, may the Lord infuse into our hearts a true and sincere spirit of humility. Amen. By the intercession of St. Michael and the celestial Choir of Dominions, may the Lord give us grace to govern our senses and overcome any unruly passions. Amen. By the intercession of St. Michael and the celestial Choir of Powers, may the Lord protect our souls against the snares and temptations of the devil. Amen. By the intercession of St. Michael and the celestial Choir of Virtues, may the Lord preserve us from evil and falling into temptation. Amen. By the intercession of St. Michael and the celestial Choir of Principalities, may God fill our souls with a true spirit of obedience. Amen. By the intercession of St. Michael and the celestial Choir of Archangels, may the Lord give us perseverance in faith and in all good works in order that we may attain the glory of Heaven. Amen. By the intercession of St. Michael and the celestial Choir of Angels, may the Lord grant us to be protected by them in this mortal life and conducted in the life to come to Heaven. Amen. Almighty and Everlasting God, Who, by a prodigy of goodness and a merciful desire for the salvation of all men, has appointed the most glorious Archangel St. Michael, Prince of Thy Church, make us worthy, we beseech Thee, to be delivered from all our enemies, that none of them may harass us at the hour of death, but that we may be conducted by him into the August Presence of Thy Divine Majesty. This we beg through the merits of Jesus Christ Our Lord. -by Rev. Andrew Hofer, OP, teaches at the Dominican House of Studies in Washington, DC. This article comes from the September 2011 issue of The Irish Rover, a newspaper produced by students at the University of Notre Dame. A perennial problem in human thinking is the question of good and evil. How can we reconcile the presence of God and the presence of evil forces that we experience in the world? In Christianity, Gottfried Leibniz (d. 1716) was especially famous for framing the question of theodicy, that is, how to justify God when we face the problem of evil. If God is infinitely good, all-powerful, omnipresent, and all-loving, how could there be evil forces at work in creation? Various approaches are taken to answer this today. One approach is to be silent in the face of the mystery of suffering. For some of those who articulate an answer, it seems that God has too exalted a job description! They want to lessen God’s descriptions. God isn’t REALLY almighty, they say. He’s working out His salvation, and ours, in a complex cosmos. An even more serious objection arising from the question of evil is that God simply doesn’t exist. This modern-sounding objection is, in fact, one that St. Thomas Aquinas considers when asking “Does God exist?” in SUMMA THEOLOGIAE Ia, q. 2, a. 3. The objection runs like this. It seems that God does not exist. If one of two contraries is infinite, the other would be totally destroyed. But this word “God” is understood to mean infinite goodness. If therefore God exists, evil couldn’t be found. But evil is found in the world. Therefore God does not exist. Few people may go through this reasoning in a logical syllogism, but many people wonder along those lines when bad things happen. How could God let my friend suffer and die? Where was God in the September 11 attacks against America ten years ago? Individual painful experiences such as these can drive people to agnosticism or atheism. For his part, St. Thomas answers the objection from evil concerning God’s existence with a quotation from St. Augustine: “Since God is the highest good, He would not allow any evil to exist in His works, unless His omnipotence and goodness were such as to bring good even out of evil.” St. Thomas continues to say that this is actually a part of God’s infinite goodness: He allows evil—and out of that evil produces good. In other words, God does not directly will evil, and when He declines to prevent it (see Job), He who made creation from nothing has a plan to make something very good out of the disorder of evil. In responding to the question of evil, the Catechism of the Catholic Church says, “No quick answer will suffice…. THERE IS NOT A SINGLE ASPECT OF THE CHRISTIAN MESSAGE THAT IS NOT IN PART AN ANSWER TO THE PROBLEM OF EVIL” (309). In the world that we have, with its freedom and the misuse of freedom in sin, there are devils and sinners. God doesn’t obliterate devils after their fall, which was their irrevocable everlasting choice against God’s goodness. God created devils originally as good angels, and their own choice to turn away from Him does not cause God to destroy them. He also doesn’t obliterate us human sinners. Even when God’s own Son became man and was crucified by evil forces, by our sins, God did not obliterate His creation. He showed that the horror imposed upon Jesus could be used for our salvation. In fact, it is by “his wounds we are healed” (Isa 53:5). When we experience evil personally, when we suffer, it is an invitation to be united with Jesus, “to fill up what is lacking in the sufferings of Christ” (Col 1:24).